As any avid sports fan or seasoned trader knows, sometimes there are lucky bounces, sometimes not. Fortunately, for many DIY investors, it was the market bears who got the bad bounce off the uprights. For many online brokerages, it’s also good news as long as the bounce sticks. In this edition of the roundup we’ve got a stacked line up of developments for DIY investors to stay on top of. First, another week in 2019 and another new cash back offer to announce – this one also from a bank-owned online brokerage. Next, we look at a slew of stories that crossed our radar last week, including the big news of the ETF alliance between RBC & iShares, leadership changes at Interactive Brokers, how Twitter is being used by DIY investors to connect with Canada’s online brokerages as well as couple of great stories of online brokerages supporting good causes. As is customary, we’ve also got chatter from the DIY investor forums to share and what folks were saying on Twitter about (or to) Canadian discount brokerages. After a long break from the deals & promotions section, HSBC InvestDirect is stepping back in with a new cash back offer for DIY investors and also offering up some serious competition for its fellow bank-owned online brokers. The new tiered promotion, which is open to both new and existing clients, offers between $188 and $1288 in cash back bonuses for deposits ranging from $25,000 to $1M+. There are two important observations about this new offer from HSBC InvestDirect that are worth noting. The first is that for the deposit range between $25,000 to $50,000, this happens to be the best cash back promotion by a substantial margin (88%). On the heels of the aggressive cash back reward on their banking side, this new offer by HSBC InvestDirect is one that might cause DIY Investors to at least kick the tires on this discount brokerage. And, even though this offer is not the best for investors with deposits between $100,000 and $250,000, it does come close to other bank-owned brokerage offers. Another important observation for this offer is the duration of it. 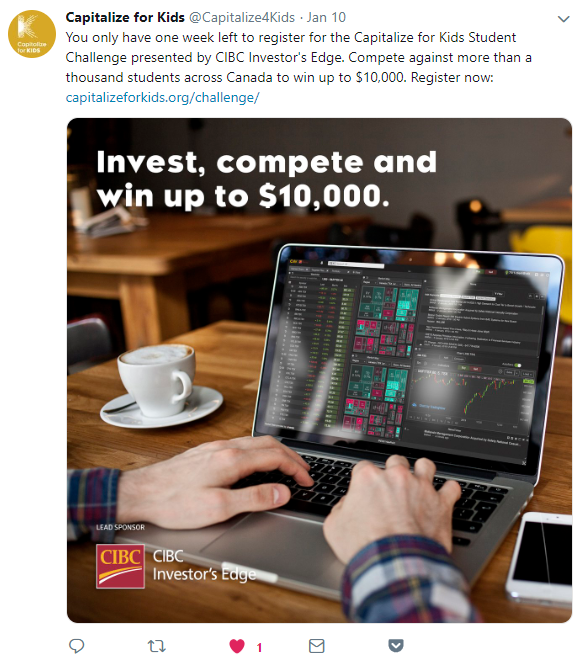 This cash back promotion is set to expire at the end of April – which is much later than offers from BMO InvestorLine (expires Feb. 28th), CIBC Investor’s Edge (Mar. 24th) or Scotia iTRADE (Mar. 31). This sets up an interesting scenario heading into the spring where, in addition to folks thinking about their RSP contributions, there’s also going to be consideration given to what to do with any income tax refunds as well. As it stands, that would leave HSBC InvestDirect with very little competition in the cash back promo segment. Of course, there are also important details for DIY investors to consider about this offer. 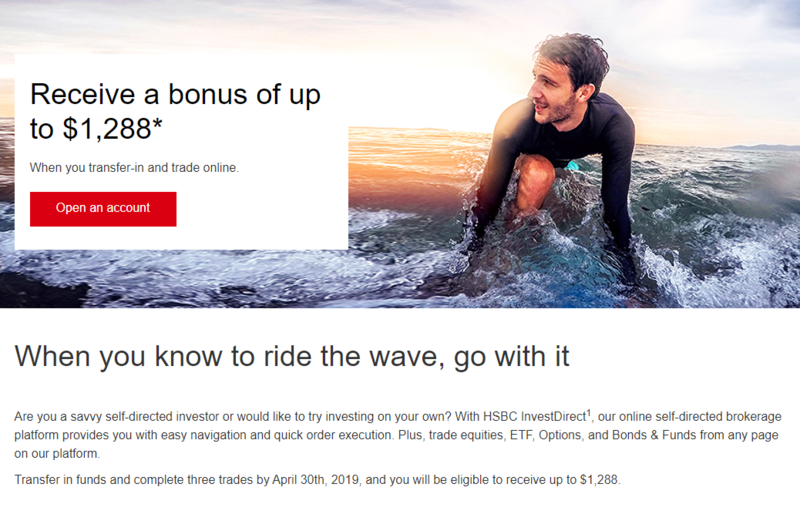 Unlike other cash back offers currently in the market, in order to qualify for this offer, DIY investors have to execute a minimum of three trades before the end of April, which at HSBC InvestDirect’s standard commission rate (for North American equities) of $6.88 works out to be about $20.64 that DIY investors have to pay. Even so, at certain tiers, it still works out to being a relatively small price to pay to qualify for a cash back reward and, bonus win for HSBC InvestDirect, DIY investors will know how low the trade commissions are per trade and might just be impressed enough to stick around. As we had mentioned in last week’s roundup, the competition for DIY investors’ assets is heating up. With another bank-owned brokerage jumping into the mix, it is going to be hard for those not in the deals pool to stay on the sidelines for much longer. The same could also be true for DIY investors considering opening an online trading account. This is probably the ideal time of year to consider opening an online account if getting an extra incentive is at all important – especially for cash back promotions. Based on this latest move by HSBC InvestDirect, we suspect it won’t be the last announcement of a new promotion for a Canadian discount brokerage before the RSP contribution deadline of March 1st, 2019. Stay tuned! This past week there was a colossal shift in the wealth management space that surely sparked intense conversation (perhaps some panic) among some of the major ETF providers in Canada. RBC Global Asset Management and Blackrock Asset management announced earlier this week that they would be forming a strategic “alliance” and combine forces to create RBC iShares. The new ETF powerhouse will have about $60 billion in assets under management and roughly 150 ETFs. 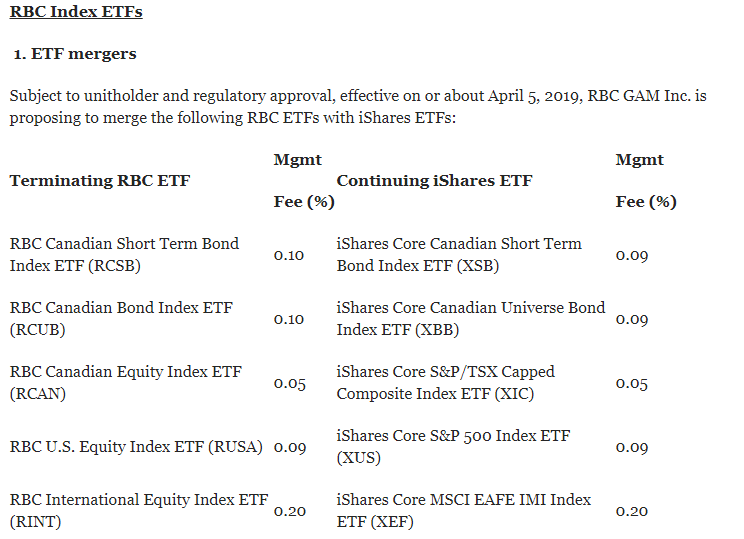 Most notably, however, it gives RBC a leg up on BMO’s ETF selection and position in the Canadian ETF marketplace. While things should largely stay the same for DIY investors, there will be a few changes made to the rosters of funds being offered which appear to be scheduled to take place around early April 2019. Importantly, there will be no change to the names or ticker symbols of RBC ETFs or iShares ETFs as a result of the alliance, which means trading them should be seamless. For more information on the new RBC iShares offering, the website: https://www.rbcishares.com/ offers up more details. Some big news for Interactive Brokers this past week as founder, chairman and CEO of the online brokerage announced that he is “retiring” as CEO and appointing long time president of the company, Mr. Milan Galik, as his replacement. According to the press release, Galik has been with Interactive Brokers for 28 years and has served as its president since 2014. This past week we noted an interesting development on social media – specifically about what DIY investors are talking about when it comes to Twitter. Even though it was a small ‘blip’ on the radar it was nonetheless important to flag that DIY investors – many of whom are on Twitter and actively trading or watching developments in the markets via their Twitter accounts, have called out bank-owned online brokerages for a lack of presence on the social media channel. To clarify, this tweet indicated one user’s frustration with being able to access RBC Direct Investing via Twitter when – according to this user – other bank-owned online brokerages offer a direct route to their self-directed investing units on this channel. For RBC, the Twitter handle @AskRBC is the single point of contact for all of the banks brands – so often answers about the specific arms are routed to those divisions. What stood out about this encounter, however, was that an influential voice in personal finance and consumer advocacy, Ellen Roseman (at the Toronto Star), also weighed in on the presence of online brokerage-specific Twitter accounts. Further, someone at the senior level of RBC wealth management also responded directly on Twitter to this DIY investor. And, while not unprecedented, it is rare to see executives at these institutions weigh in on individual issues. Of course, we’ve noted that an online brokerage doesn’t need its own Twitter handle for executives to get involved. The president of BMO InvestorLine, for example, does have a Twitter handle and has personally responded to individuals even though BMO (like RBC) has a central Twitter handle. 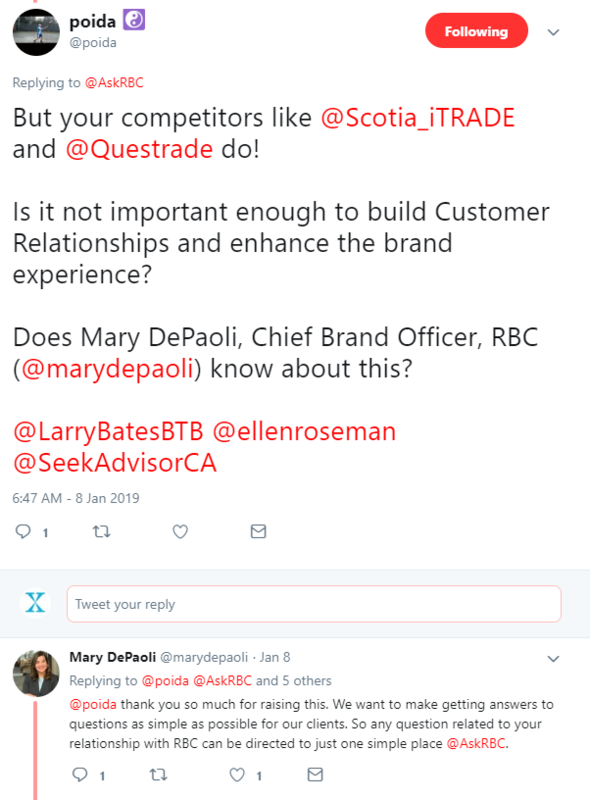 Conversely, we haven’t really seen Scotia iTRADE’s senior executives take to the Scotia iTRADE Twitter handle to respond directly to a user in the same fashion – that is typically handled by their social media team. The conversation about the conversation on Twitter among DIY investors and online brokerages is an interesting one. On the one hand there is typically a lot of sensitive information that neither party would want to disclose to the general public. On the other, part of the strength of a platform like Twitter is that it provides a very public and documented opportunity to call attention to the strengths and shortcomings of a particular brand – in this case an online brokerage – to a wider audience. Moreover, it appears that at least at some bank-owned brokerages, comfort with engaging directly on Twitter is growing (albeit slowly). Most importantly, however, it shows that it is important for online brokerages (not just the parent brands) need to consider making themselves accessible to DIY investors on the online channels that they’re clearly spending time on. Also spotted on Twitter this past week was a notice from Capitalize for Kids, the non-profit organization dedicated to helping raise funds for research in children’s mental health. Another trading competition for students across Canada is being launched with the top prize of $10,000 going to the winner of the contest. The lead sponsor of the competition is CIBC Investor’s Edge. Visit the Capitalize For Kids website here for more information & be sure to share. 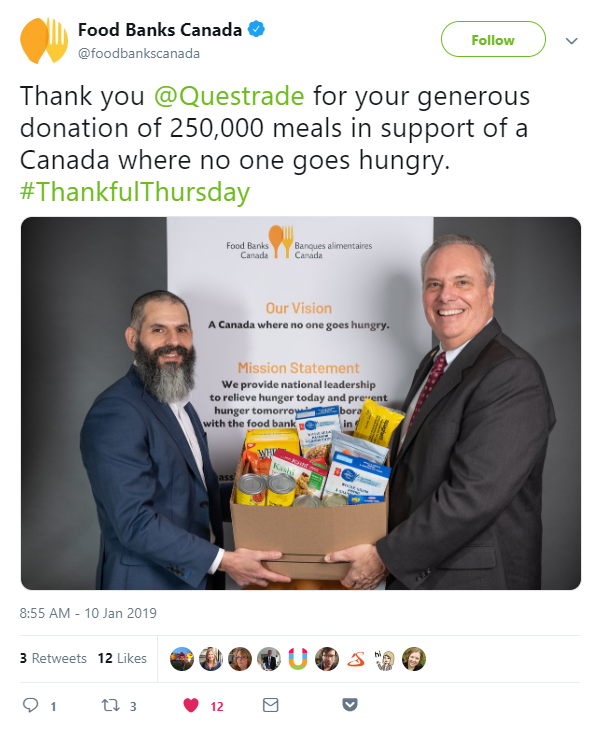 Another very inspiring bit of news to kick off the new year (also spotted on Twitter) was the tweet from Food Banks Canada announcing the support given by Questrade to donate the equivalent of 250,000 meals to the organization. In many respects it is a win-win-win with. The benefit for Questrade is that they’re demonstrating their commitment to being a socially responsible organization. For a certain demographic (i.e. millennials) what a brand stands for (and what they actually impact) is an important component in deciding whether to work for or purchase from that brand. Questrade’s recent tv/video commercials have also positioned them as a challenger to traditional fee-based advice, so this initiative amplifies some of the messages about their brand they’re trying to create. And, as a bonus, organizations such as the Food Bank of Canada stand to benefit and in turn, provide assistance those in need. The wealth management waters are getting choppy. This forum user notes RBC’s move to partner with Blackrock and takes to the forums to see what this means for investors and how it changes the landscape for other wealth management firms. Despite digitization taking hold of the world, there are clearly pockets of the wealth management space still working on analog. This forum user was shopping for portfolio managers and tried to find tips on where and how to find the right fit. If the pace of 2019 already being set is any indicator, this is going to be a very eventful year. Interest rates may not have made the same new year’s resolutions as a lot of others, and instead look to be taking a breather – which will be good news for equity investors – for now. Perhaps the best news is that we now know the official date that Winter is Coming – which will be later this spring. Go figure. Either way, investors will want to stay frosty for the volatility ahead.